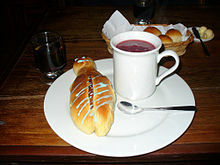 Colada morada (Spanish for purple strained) is a traditional Ecuadorian beverage prepared with black corn flour and fruits such as naranjilla, babaco, pineapple, blackberries, strawberries, and blueberries (which give it its color). The drink is sweetened with cane sugar, known as panela, and prepared with spices such as cinnamon, allspice, cloves and herbs such as lemongrass and lemon verbena. It is traditionally consumed on November 2, All Souls' Day, with a type of bread called t'anta wawa or Guagua de Pan which are bread figures shaped like babies and often decorated with colorful icing and filled with fruit jam (strawberry or guava). In indigenous Andean communities, especially in rural areas of the Chimborazo province, it is consumed and offered in the cemetery next to the tomb of deceased relatives as part of the rite of reunion with ancestors. This page was last edited on 1 November 2018, at 10:01 (UTC).